It’s a peculiar and depressing phenomenon that women—far more than men—who have moved past youthful attraction and procreating age tend to become invisible. So a film featuring a 58-year-old female divorcee is something of an anomaly (you can watch the trailer here). Trend-bucking protagonist Gloria (who lends the film its name) refuses to be typecast. Her now-grown children have left home and are having children of their own. Her ex-husband has moved on. She would like to move on too. Attempting to defy loneliness, disconnection, and old age, Gloria ventures out to singles parties. This is where we meet her in the subtitled Chilean film’s opening scenes, swallowing a drink and plucking up the courage to enter the dancing and dating fray. But her prospective beaus bring a lifetime of baggage and bad habits, and Gloria finds her flings brief and unfulfilling. Adult courting is, it seems, just as awkward and excruciating as when you’re in your teens. Then Gloria meets Rodolfo, a former naval officer now fun-park owner seven years her senior and with whom she can actually imagine a future. Yet the relationship’s not without its quirks and challenges, and it’s these difficulties and how they infer to the rest of Gloria’s life that provide the film with its main narrative drive. Without giving too much away, we gain insight into Gloria through these events and incidents and how she handles herself throughout them. She is a fascinatingly complex, strong woman we come to admire and respect. Gloria is an understated lead and the film itself is quietly, thoughtfully unveiled. Which makes it sound, on paper, as though it’s slow and boring and lacks the makings of a hit, but it’s the antithesis: subtle, surprising, compelling. Gloria is someone who could be our mother. She’s someone I’m conscious I might grow up to be (and yes, that realisation was rather like having to face my own mortality). The film, which is told from Gloria’s point of view, contains not a single frame in which her body isn’t present. Every scene ekes out information about how she’s feeling about life and how and where she fits in with the rest of the world. Here’s the zinger: Gloria plays a supporting role in the lives of those around her, yet Gloria has managed to turn a supporting role into a leading one. The story is mature, nuanced. Gloria is an unobtrusive character, more observer than at the centre of the action. Her vision is failing and her over-sized, almost Coke-bottle-thick glasses dominate her face. She scrambles with putting them on, adjusting them, and occasionally taking them off throughout the film—they’re an aid as much as a hamper. Perhaps most surprising and haunting is that Gloria’s is a story that’s everyday, yet we’ve never noticed or considered it before. Gloria offers us a new lens through which to look—I’m now looking around me with a new perspective and clarity. Chilean actor Paulina Garcia, normally a theatre actor and now, like Gloria, playing her first leading feature film role, inhabits Gloria magnificently. Her actions are strong yet mild, grief-stricken yet stoic. She’s determined to find a place for herself—and to find love—in a world that overlooks her for both. Garcia was awarded the Best Actress award at the 2013 Berlinale film festival; the film won Best Film at the same event. The jury reportedly commended the film ‘for its refreshing and contagious plea that life is a celebration to which we are all invited, regardless of age or condition, and that its complexities only add to the challenge to live it in full’. I agree with that sentiment. Gloria surprised me—I’ll admit I paused momentarily when I was offered its review. I wondered: What insight could I possibly gain from the film or offer on its verdict? Would I even be able to maintain interest for its entirety? The answer is a simple yes. The film’s not slow, it’s thoughtful. Gloria is not definitively sad, she’s ultimately extremely optimistic and resilient. The story’s not ordinary, it’s utterly important and relatable. Next time I hear a love song come on the radio in my car, I’ll be smiling and singing along and thinking of Gloria and women like her (which may include me). Which begs the question: If there are few (or I’ve missed) films featuring ordinary women not traditionally put in leading roles, I’ve missed books that do similarly. If I were to try to expand my reading oeuvre accordingly, which book(s) would you recommend I start with? Thanks to Rialto Distribution for the Gloria review opportunity. 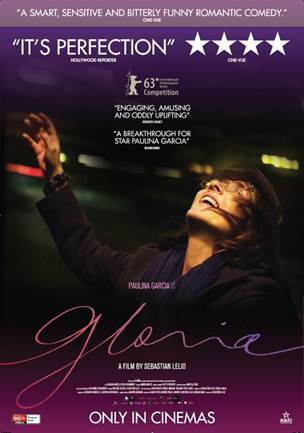 Gloria is now open at selected cinemas nationally.